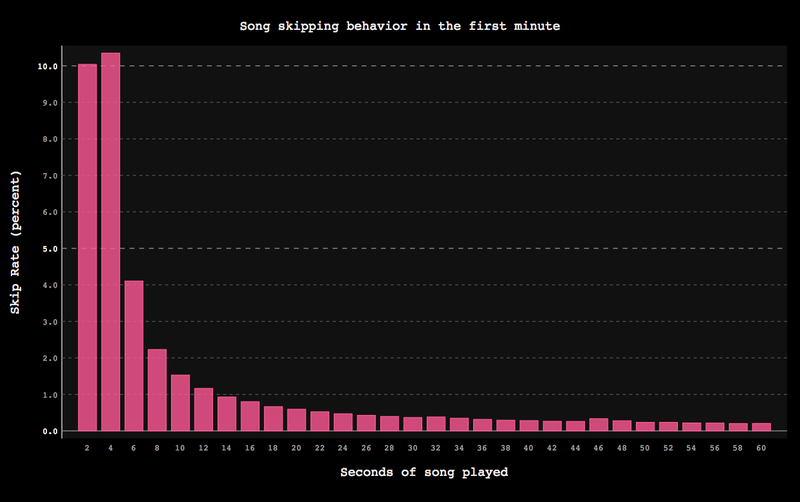 You're almost exactly as likely to skip a song while streaming music as you are to listen to the whole thing. This series of graphs explains what it is that makes it so hard to listen to a song through the end. Paul Lamere (who previously used music streaming data to generate maps of the music that's regionally loved and hated around the country) has now used data from Spotify to look at just how -—and perhaps, why -—we skip so much music. If you're going to skip a song, there's a good chance it's going to happen in the first 30 seconds. In fact, there's a 25% chance that the skip will actually come in the first five seconds. In total, the likelihood that you'll actually listen to a song through the end is just over 50%, as broken down by seconds in the graph above or by percent listened to in the graph below. The average listener ends up skipping just under 15 songs an hour. So who is skipping the most? The first theory is that the skipping rate is a indication of how much free time a person has time. Teenagers skip more because they have more time to devote to editing their music stream, whereas thirty-somethings, with their little kids and demanding jobs, have no time to pay attention to their music players. The second theory, suggested by Spotify über-analyst Chris Tynan, is that the late-forties skipping resurgence is caused by teenagers that use their parent's account. Time of day is also a factor, with the late evening and the early night being the time when our musical capriciousness peaks. We can't chalk up all our music-skipping to lack of attention, though. Since the data was gathered through music streaming services, it's also likely that much of the early skipping behavior is due to people checking out new music or running through other people's shared playlists. On a different platform (whether digital or analog) that included only songs that a listener had pre-selected, the frequency of skipping might be lower. Graphs: Paul Lamere / Music Machinery.